MainAll NewsInside IsraelSupreme Court: Why is removing Arab traffic hazard low priority? Supreme Court: Why is removing Arab traffic hazard low priority? Supreme Court wonders why removal of traffic barrier to prevent accidents for illegal Arab construction is a 'low priority' for the State. The Supreme Court ruled Wednesday against the owner of a Lebanese restaurant which was established illegally just a few feet from the Trans Samaria highway near the city of Ariel. The owner of the restaurant, an Israeli-Arab citizen from Abu Ghosh, opened the eating establishment several years ago illegally and without a business license. 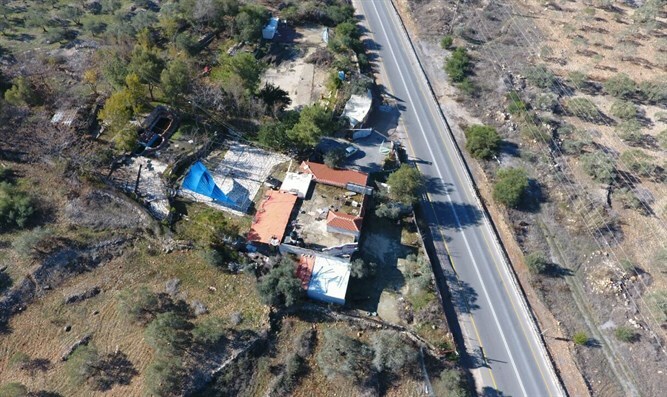 The owner further violated the law by paving an access road connecting the restaurant to the Trans Samaria Highway, where thousands of vehicles pass every day. The illegal approach is located at a dangerous spot where there is a continuous safety railing preventing cars from going off the road. The Regavim legal organization and the Samaria Regional Council warned the owner that he was creating a public safety hazard by removing part of the barrier to allow access to his restaurant. After the owner dismissed their concerns and removed a portion of the safety railing they filed a petition with the Supreme Court. During Wednesday's hearing, the Supreme Court Justices criticized the State's position that the removal of the railing does not constitute a significant traffic hazard, thus leaving the enforcement of the law subject to the priorities of the Civil Administration. Justice Elyakim Rubenstein noted that the restaurant owner did not show up for the hearing, and asked if the State did not find it jarring that an individual would show such blatant disregard for its authority as to remove a guard rail which protects motorists. The State representative responded that it is indeed jarring. The State said that would would conduct tests to determine if the removal of the guard rail represents a significant traffic hazard, and will submit its response within 45 days. "There is no basis for [the State's] claim that it is a low priority [issue]," said attorney Boaz Arazi. "If there was an accident, heaven forbid, the next day it would be in the headlines [and become a high priority issue]. The question is, why not take care of it before it is too late for the victims?" Yossi Dagan, the head of the Samaria Regional Council added, "This is a serious case, not only of illegal construction, but of a life-threatening hazard. I am glad that the Court came around and set the record straight. We look forward to the removal of the hazard from the location - and not having to hear about another accident due to the negligence of the [relevant authorities]."